Krysthina Ortiz refused to get up from a chair outside her school’s main office. Tears streamed down the 9-year-old’s face as she looked up at her mother, Krysthia Gauthier. Krysthia Gauthier and her daughter Krysthina Ortiz inside her new school in Worcester, Massachusetts. It was an early Friday morning in October at Woodland Academy in Worcester, Massachusetts, and the large brick building was new terrain for Krysthina. She and her mother had arrived in the city just three days earlier to stay with Gauthier’s sister, who is part of the city’s sizable Puerto Rican community, after fleeing their Hurricane Maria-ravaged island. Like many cities with long-established Puerto Rican populations, Worcester is seeing an uptick in Puerto Ricans migrants, Gauthier and her daughter among them, following Maria, which struck the island with devastating force on Sept. 20th. With a long and slow recovery from Maria’s massive damage in the forecast, that migration is likely to persist. Because of Maria, between 114,000 and 213,000 Puerto Rico residents are expected to leave the island annually, according to a new report from the Center for Puerto Rican Studies. Worchester’s schools are feeling this influx; during the final two weeks of October alone, some 90 new students enrolled in them. Most were from Puerto Rico, with a few from the U.S. Virgin Islands, which Maria also left in ruins. For Gauthier, the decision to leave was a hard one. Though her home in Canóvanas, a municipality in the northeastern region of Puerto Rico, withstood the storm, she explained, island-wide power outages affected schools, and it was hard for her to get to her job as a tire shop manager. The roads in Canóvanas suffered extensive damage, and food and clean water were becoming scarce. The move to the U.S. mainland has been a big adjustment for Gauthier, whose husband stayed behind to save money and watch over their home. She said she’s walked around her new neighborhood in Worcester to familiarize herself with it, and her face lit up with excitement over an upcoming job interview she was able to secure. She also draws strength from her love for her daughter. “She’s all I have,” Gauthier said, her eyes moist with tears. In Worcester, officials and community organizations have been bracing for this new migration since Maria hit the island. At a recent School Committee meeting, School Superintendent Maureen Binienda said that upon enrollment, new students undergo an evaluation and receive services depending upon their level of proficiency in English. “People should know, we are preparing for this,” said Worcester Mayor Joseph M. Petty during the meeting, adding that a committee of city leaders has been formed to address the hurricane-related influx and such immediate needs as locating affordable housing for Maria-related migrants. Shyly, Krysthina shrugged. Gauthier appeared relieved. Mother and daughter then held hands and stepped onto the sidewalk – on the way to their new home. Amaris Castillo is a journalist whose work has been featured in The Bradenton Herald, Tampa Bay Times, Fusion, Latina Magazine, the Huffington Post, Vivala, Flama and La Galería Magazine. She is the creator of Bodega Stories, a multimedia project featuring human stories from the bodega, a beloved space. 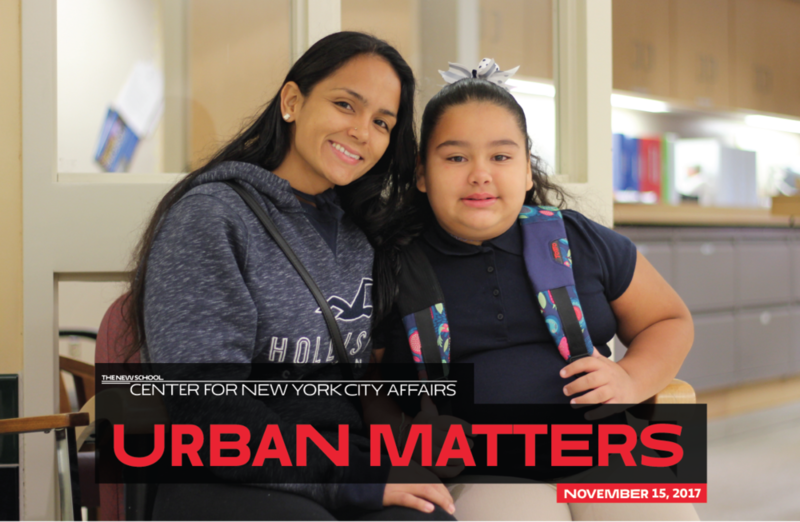 This Urban Matters is adapted from her recent story for Feet in 2 Worlds (Fi2W), a project of the Center for New York City Affairs at the New School. It’s part of Fi2W’s new series on migration from Puerto Rico in the wake of Hurricane Maria.